We are always interested in putting numbers into perspective, so we were interested in this article in which they put the Hurricane Harvey’s rain into perspective. Let’s put it in context. Much of the Northeast Corridor — Washington to New York and Boston — maybe receives maybe between 40 and 45 inches of rain a year. Think of all the rain you get in July through Christmas and put that in a couple days. It’s a lot of rain. It’s easy for us to think in terms of New York City, so we looked up some weather data. See the table at the top of this post (all figures are in inches). First thing we can notice is that the expert understated things, for New York at least. 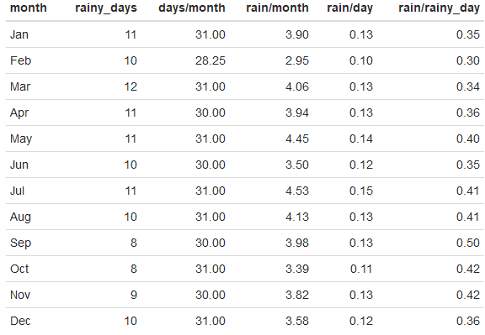 Thirty five inches would be equivalent to all the rain in NYC from April (not July) to December, inclusive. But we agree that it’s a lot of rain. We’ve always had trouble putting rain forecasts into perspective, so here are some rules of thumb we figured out from the data that we’re going to memorize. If you live in the corridor from DC to Boston, you may find these useful. The average amount of rain per rainy day in NYC is .38 inches, which conveniently is about 1 cm. When you hear it’s going to rain 1 cm or 3/8 inch, you can think “no big deal, that’s a typical NYC rainy day”. If you hear it’s going to rain an inch, you can think “oh darn, that’s like three rainy days worth”. Out here in the high dessert (Boulder, CO) we get 19-20 inches/year. In Sept 2013 we got that amount over 3 days. It was a lot of rain and caused a lot of flooding for systems that were expecting that much over a year. How much will that Texas rain be was written on August 25, 2017 and filed in Encyclopedia,Ideas,R.